In an attempt to get with the times and extend their campaigning to mobile users, both major parties have been releasing iPhone apps. Both apps have a news section. On the Labour app, headlines are clearer, a brief extract is provided, as well as a small picture. This makes the headlines easier to scan. It also has a local news section. However, at least the news is actually up to date on the Conservatives app. The screenshots above were taken the morning after the election was called, but the latest news on the Labour app is a couple of days behind, rendering it virtually pointless. The background on the Tory app of a blue sky may be party colours, but the lighter parts and the relatively small text makes the articles harder to read than those on the Labour app. This is an area the Labour app wins hands down, since it asks users for their current location and uses this to serve up local news (though it is about two months out of date in my case), as well as the details of Labour candidates in my area. There is also a local events section, though this is more of a blank slate to be filled by your own telephone canvassing and doorknocking activities. The Labour app is called ‘iCampaign’ so is naturally more geared towards campaigning with the local events and links to find your local MP and volunteer to help. The Tory app has a donate link, though you have to either attempt to negotiate the payment screen on a website that has not been optimised for mobiles, or else call an 0845 number from the phone to donate. The Conservative app contains links to the party’s Facebook page, Twitter account, and YouTube channel, each of which takes users away from the app and opens these pages in the mobile browser. Labour only links to its Twitter page, but it does open it up within the app, which is more useful in some ways, but it does mean you can’t reply to messages or add any retweets. I’ve covered most of the features of the Labour app, but the Conservative app has a trump card here I haven’t mentioned up to now: a swing-o-meter. Tilting the handset to the right (of course) will show the possible outcome on the map and in seat numbers, depending on the percentage swing to Conservative. Very neat. Both apps have their flaws; the Conservatives’ app has text so small that policies and news articles are harder to read than they need to be, while Labour should make more effort to keep the news on its app up to date. Frankly, neither app is especially inspiring or useful to the average voter beyond spelling out where the parties stand on the major issues. Thanks to the ‘wow factor’ of the swing-o-meter, the Tory app just shades it. 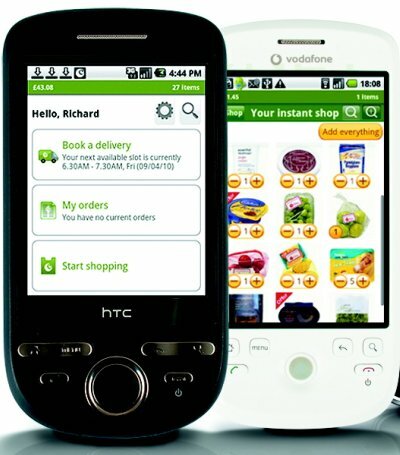 Ocado has launched another mobile app, this time a voice search app for Android phones, and the online grocer seems to be having some success with mobile commerce. Having launched an iPhone shopping app last year, this move broadens Ocado’s mobile presence, making the app available on 20 different handsets. The future is mobile. At least that’s what many suggest. Yet multi-channel retailers are largely ignoring mobile right now. That’s according to a report from Multichannel Merchant. It found that, as of February 2010, four out of five multi-channel retailers surveyed were not doing anything in the realm of mobile commerce. 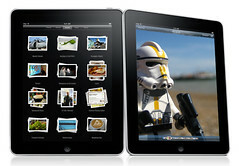 Is the iPad already influencing big publishers? The iPad is on its way. Apple started accepting pre-orders earlier this month, but there are still many unanswered questions about what iPad will deliver in its final form. One thing that almost certainly won’t be present when the iPad ships: support for Adobe Flash. That has numerous raised questions about both the iPad and Flash. After all, if the device Apple is betting so big on doesn’t support Flash, will publishers, who have seen Apple’s success with the iPhone, be forced to adopt Flash alternatives in order to position themselves to cash in if the iPad achieves success of its own? Or is Apple simply fighting a fight it can’t win?